They have are the driving force we should thank because they keep the PBB problem from the deepest of back burners. Emory of Atlanta, GA, along side the Michigan Department of Health, are the keepers of our family health histories and data. 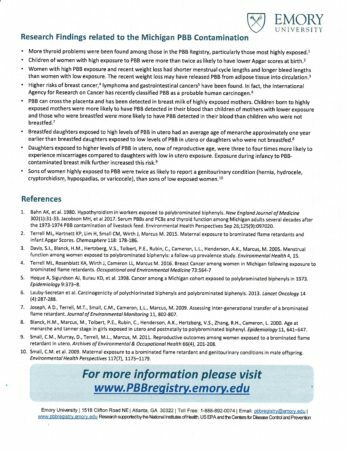 The agenda was to discuss the Michigan PBB Database research and to recruit people to donate their blood for their research. 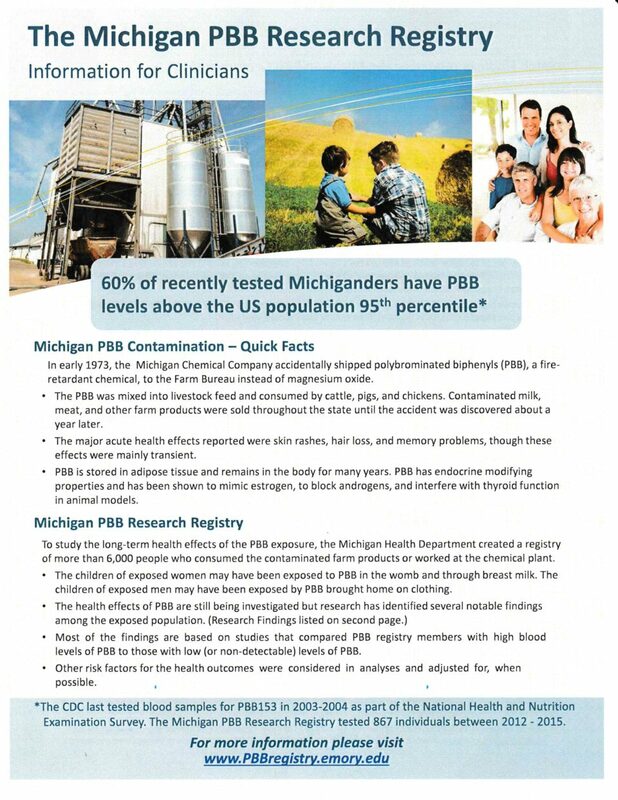 My personal agenda was to meet others passionate regarding PBB and to ask the researchers VERY specific scientific questions that my research has been unable to answer. 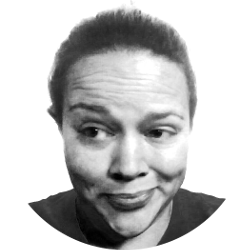 My scientific background includes laboratory technician positions at the Mayo Clinic, Fred Hutchinson Cancer Research Center, and Amway. I have also worked in cleaning, mechanical, process, and equipment validation. This month my research had been trying to answer one question, “How do we get back to good once we realize we’re still reeling from PBB?” I was disappointed to find Emory offers very little in the way of recommendations for healing to the victims. I realize Emory must follow the laws as they were set when they began only five years ago (some members of the team became involved more than two decades ago, through other teams). I hope someday the registry will help the victims. However, the “boxes of records still unopened from the 70s” gives me little hope at this moment. Will I sign up or recommend my family members do so? No, and here’s why: To be an effective leader, the leader must not waste people’s time. These people have been giving for decades and now their grandchildren are suffering. They give hoping for help and are repeatedly offered, “These things take time.” It has been 45 years and the people have nothing to help them other than the chemical plant’s ongoing site cleanup. Perhaps Dr. Marcus was having an off day and I misunderstood. Perhaps she’s over extended and under funded (highly likely). However, that is not an excuse to suggest people continue to wait for new data while third and fourth generations suffer. I genuinely hope this meeting helped the Emory team realize they will not continue to receive data if the people don’t feel the university is making a difference for the victims. This morning, I’m already messaging with the new friends from last night. They feel like they’ve been treated like guinea pigs. Even with that said, I still get the sense of good intentions from the team members of Emory. I believe these handouts, which Emory distributed at the meeting are fantastic (above). The information included is helpful if you’re new to the topic. Since many of our physicians are completely unaware of the impacts still resonating in their patients, we should bombard our doctors with this first one (double-sided), sub-titled, “Information for Clinicians.” Email it to them. Fax it. Print it and hand it out to every health worker you come in contact with at the doctor’s office or while visiting with your friends and family. If you don’t know much about it and feel like you don’t have a right to pass it on, I’d like you to know, the handout has numerous links for your physician to follow-up. You do not need to be the expert. Even if you don’t think you are a victim, it’s still vital our local health workers are aware of the situation. This community should never be treated as “typical patients” because we are full of the PBB byproducts and subsequently highly sensitive to each exposure we receive, on a daily basis. The amount of medications I have taken because I was being treated as a typical patient… well it would horrify you all. My brain is still attempting to recover from the medications and with each “good day” I have, I feel one step closer to figuring out how to help the entire community. I feel like this is my life’s purpose (outside of being the best mom I know how). Thank you to those who have already been supporting me. Following are the other six handouts. So back to the meeting last night: I found one major theme from the attendees; the families of the chemical plant workers are done being asked to donate their time, story, and blood. They have been doing it for decades, with almost no return for the farming families. Personally, I believe Emory’s research is vital to keep us on the government’s radar. Without “proper” scientific methods being followed, there would be “no proof” the government would find adequate to fund cleanup projects or research. I do not think Emory’s work is in vain, however, I know time is precious and I think there are better ways for the victims to spend time on this topic. I would never look down on anybody who disagrees with me. I’m newer to this and am speaking from my life experience. I have done all research with absolutely no special access to technical literature. If I can’t get it for free, I’m not going to bother (at this point). So, how does a university with accounts and access to numerous scientific journals, not seem to have done their research? I went to the meeting, very hopeful and left realizing I have a lot of articles to write to share what they don’t (won’t? can’t?). Dr. Marcus also announced (and asked for volunteers) for a project she hopes to conduct. This one will study the effects of Rapid Removal of PBB Techniques. So… I’m reading between the lines; the knowledge to help us is known and not being shared. Why not? If they shared it now and they weren’t tracking the results with regular blood samples, they won’t get the data. So, for us to remove it without them being allowed to control and monitor the results… well that would be detrimental to their studies. I’m not that interested in their studies because it seems they’re not working on ways to share their results with the general population. Another reason to not share is of course, liability. If they share something and it makes people sicker, they will be sued. I however, with all of the disclaimers and constant reminder that I’m NOT a physician, will continue to offer my recommendations. I make my recommendations based strictly from chemistry and historical data from other heavy metal chemical contaminations around the globe. Free – Get yourself sweating for at least 15 minutes a day, to keep the toxins from settling in your immune system (lymphatic system). When they are on the move, they cause much less damage.